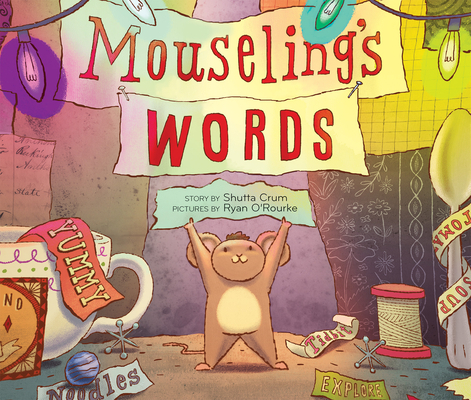 In this lively introduction to the pleasure of words, a timid young mouse's first trip out of the nest becomes a reading adventure. Mouseling has grown up surrounded by words, scraps of paper torn from menus. Once he leaves the nest, he decides that discovering words is his mission in life and finds more words than he can count, spelling and sounding them out, thrilled by each one. The library offers a treasure trove of words, also danger: a cat. When Mouseling realizes that the cat would rather know what's in the books than eat him for dinner, he starts reading aloud to the cat—the best gift he can give in exchange for the world of stories. Shutta Crum, formerly a librarian, currently writes full time. Among other picture books, she is the author Thunder-Boomer (Clarion), which received four starred reviews, was nominated for a Cybil Award, and was an SLJ Best Book, a Smithsonian Magazine Notable Book, and an ALA Notable Book. Shutta was born in Paintsville, Kentucky, and lives with her husband in Michigan. Her website is www.shutta.com. Ryan O’Rourke has BFA and MFA degrees in illustration from the University of Hartford. In addition to teaching and creating editorial illustrations, he has illustrated several picture books. Mouseling's Words is his first for Clarion. He lives in New Hampshire.